Will I Gain Weight if I Had 3,000 Calories Today? A special restaurant meal or an indulgent night of drinking that made your total calorie intake for the day come to 3,000 calories might make you feel as if you've gained 10 pounds overnight -- but you haven't. Weight gain requires you to consume a calorie surplus over several days, weeks or months. A day of overeating might temporarily affect your scale because it causes you to retain fluid, but it's hard to take in enough calories in one day to gain significant weight. One 3,000-calorie day will not blow your entire diet or curtail your attempt to achieve a healthy weight. You'll only gain weight if you continue to eat more than you need on a regular basis. To gain a pound, you must consume 3,500 calories on top of what is required to maintain your weight daily. How many calories you burn from your day-to-day activities varies depending on age, gender, activity level and size, but generally falls within 1,600 to 3,000 calories. Based on these average figures, a 3,000-calorie day means you likely only ate 1,400 extra calories, at most. If you're a sedentary 50-year-old woman with a daily 1,600-calorie maintenance intake, consuming 3,000 calories in one day might cause you to gain 0.4 pounds. If you keep eating this surplus daily for a week -- you'll notice this increase on the scale. A one time 3,000-calorie day will barely register, however, especially if you get back on track the following day. To gain a pound in a day, you'd need to consume 3,500 calories in addition to your maintenance needs, or a total of between 5,100 and 6,500 calories. You'd have to consume a lot of food to reach the 5,000 or more calories you'd need to gain a pound in a day. For example, three glasses of red wine has 375 calories, a serving of restaurant nachos with beans and cheese has 486 calories, and two slices of commercial pepperoni pizza has 538. Even if you ate all of this in addition to a 600-calorie breakfast and lunch and a couple of 300-calorie snacks, you'd still come in at 3,200 calories for the day. 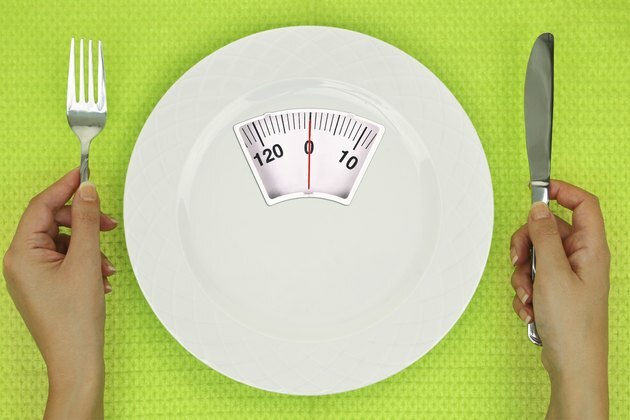 You'd have to eat six glasses of wine, two servings of nachos, four slices of pizza and an extra 200 to 300 calories at breakfast and lunch to come close to the total 5,000 or more calories that will put you at a pound-gaining 3,500-calorie surplus in one day. The scale measures fat, but also muscle, bone, organ and fluid weight. Chances are your 3,000 calories came in part from some combination of chips, snack mixes, sweets, processed foods or restaurant meals. These processed foods contain high levels of sodium and carbohydrates, both of which encourage your body to retain fluids. Water retention makes the number on the scale increase by several pounds, but your weight usually normalizes within a few days of returning to a healthy eating and exercise regimen. If you indulge one day and the scale numbers don't return to normal after a week or so back at your normal healthy eating routine, you might need to evaluate your dietary habits. Weight that's continuously creeping up is a sign that you are consistently eating more calories than you burn. To prevent further weight gain, move more during the day -- vist your office co-workers in person instead of sending an email, take a lunchtime walk instead of heading to the local fast food restaurant, or add 15 to 20 minutes to your workout routine. Also, examine your diet for sneaky calorie sources. Just 250 extra calories per day could lead to a two-pound gain per month. Alcohol, soda, fancy coffee drinks and cheese on salads are all possible culprits. Write down what you eat for three or four days to help you identify where you can cut back. You may be eating more -- and less healthfully -- than you think. Psychology Today: Do You Suffer from Scale Addiction? Will One Night of Binging Make Me Gain Weight? Can I Get Fat From One Day of Binge Eating? Why Can't I Lose Weight on 1300 Calories a Day?